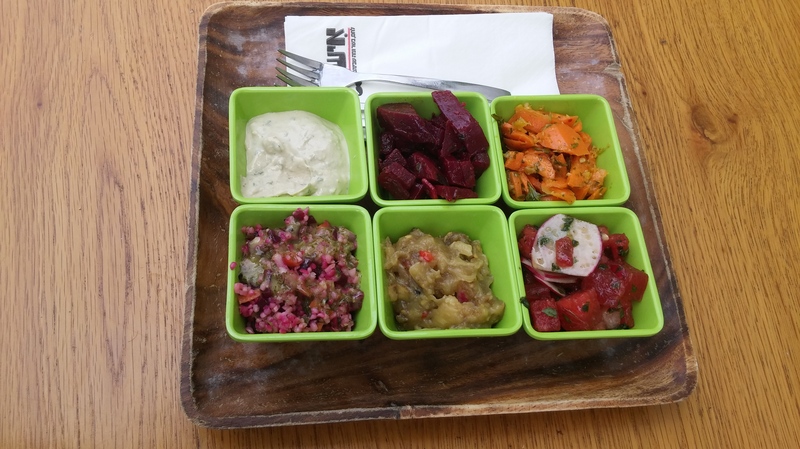 The trend of kosher restaurants opening up in Tel Aviv is a marvelous thing. 10 years ago you were maybe able to find a kosher falafel stand or a very fancy gourmet restaurant. That isn’t the case today. Everywhere you turn, you can find somewhere kosher to eat, milk or meat. The trend has now hit the art-deco neighborhood of Neve Tzedek, in the city center, by the Shalom tower. 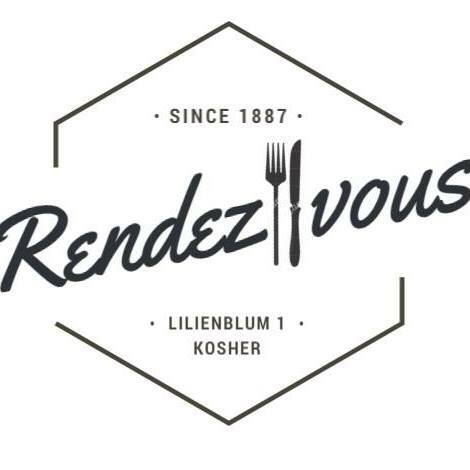 The restaurant I visited (I was a guest) is called Rendezvous (Kosher Rabbanut Tel Aviv), an Italian restaurant, run by French chefs. The restaurant took over for the Italian House restaurant that has been there for a very long time and was not kosher. When walking into the restaurant, you feel like you are taken back to your grandparents house; beige wallpapers, big mirror with big frames, old-fashioned couches a very comfortable environment. The wait staff was super nice and polite, and made me feel even more comfortable. oil in it and it just blew my mind and the brioche was perfect for mopping up the sauce. The eggplant cream dish was a nice dip, smoky and salty, the way a dish should be. 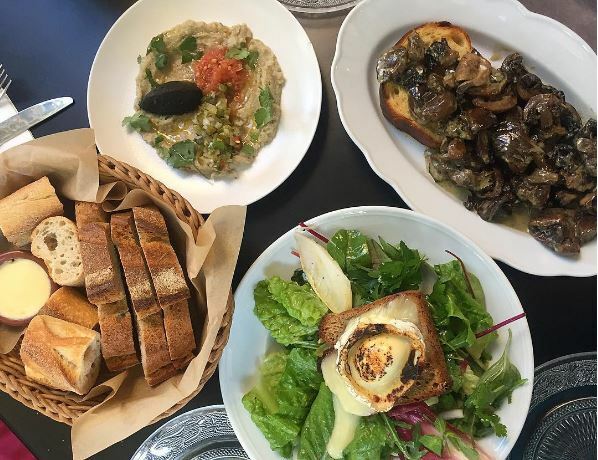 The salad was very refreshing and very french with blue cheese hidden in the endive leaves, although the salad was nice, the crostini with the melted Camembert was my favorite part of the salad. Who doesn’t love grilled cheese? 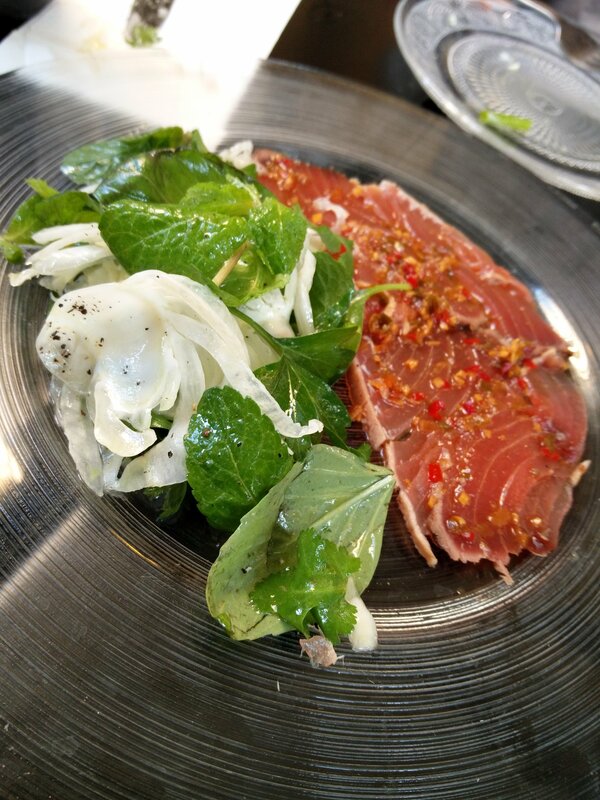 Then I brought a dish that was on the specials menu, a salmon sashimi with a side salad. 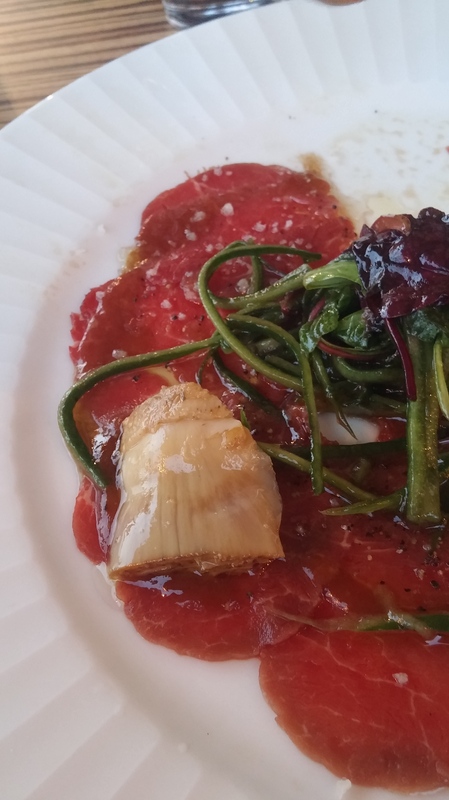 It was a very delicate dish, very light and very good. 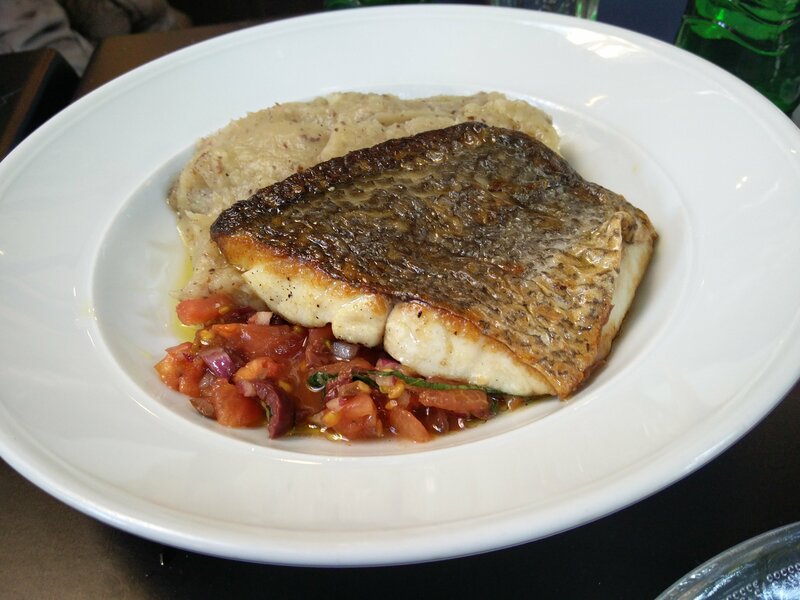 Then for the main course, the chef sent out, a truffle and porcini mushroom parpadelle, pizza tortofu, a red drum fish with mashed potatoes and a tomato salsa and one last dish of salmon fillet also served on a bed of mashed potatoes. I’ll start with the pizza since it was very interesting. I wouldn’t have called it a pizza, it was more like a quesadilla because the dough was super thin and soft. 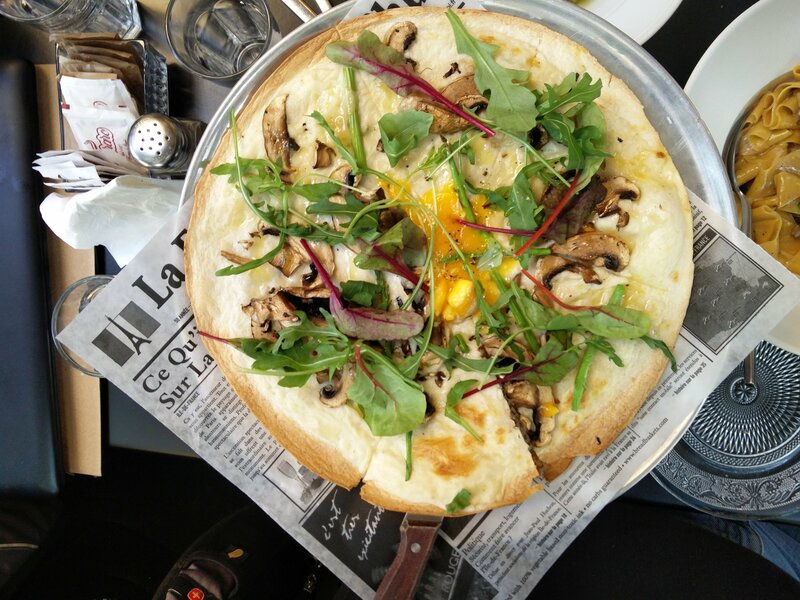 The toppings were interesting too; asparagus, arugula, truffle oil, béchamel, Parmesan, and a runny egg. It wasn’t my favorite and could have used more cheese. Then I tried the parpadelle which was sadly missing seasoning and a mushroom flavor. 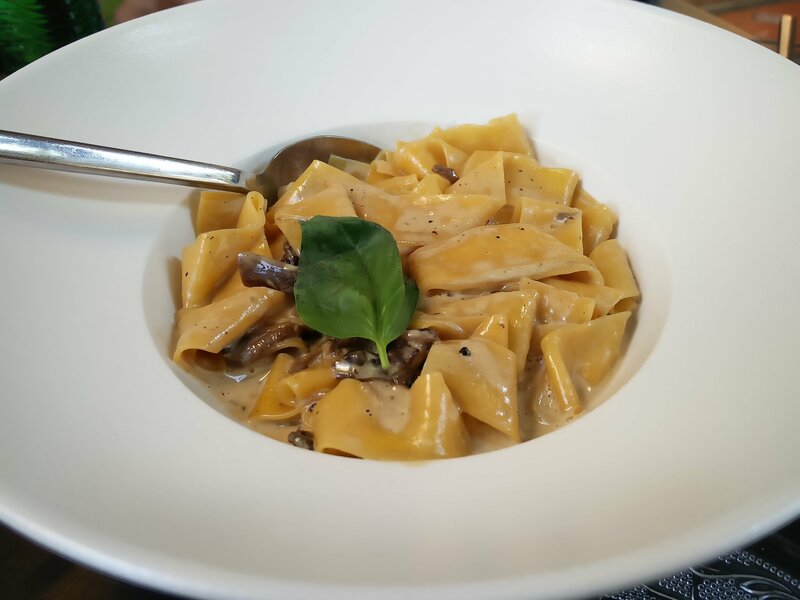 The handmade pasta was very nice and al dente but the flavors in the sauce weren’t there. The fish dishes were on point. 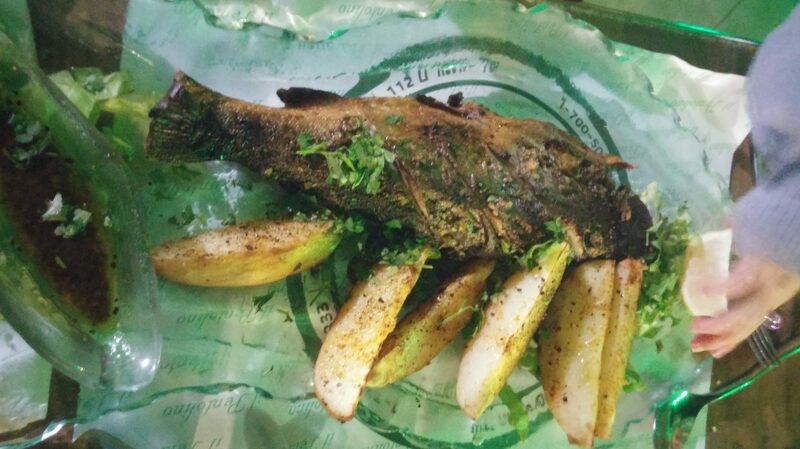 The red drum fish was cooked perfectly, flaky seasoned well and melted in my mouth. The same for the salmon, cooked to perfection, full of flavor, and a crispy skin for texture. The mashed potatoes were super creamy and full of flavor and weren’t runny at all. We didn’t have dessert because we were already busting at the seams, but they looked delicious! For a new restaurant, the food was very good, great service and a very nice ambiance. 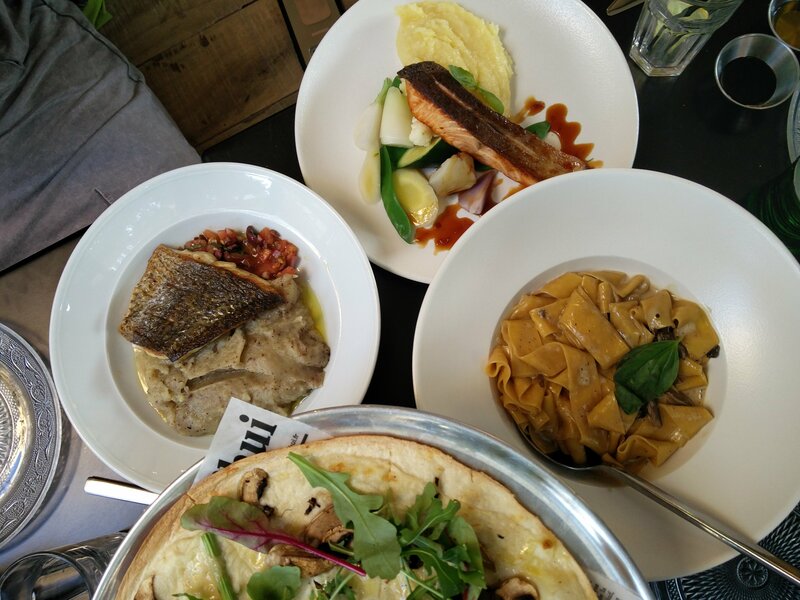 Rendezvous is a great addition to the beautiful Neve Tzedek neighborhood and to the kosher food world. A great Italian Dairy Restaurant in Eilat with ridiculous Bagels! When you travel down south to the city of Eilat, there’s a chance that the hotel you go to offers half-board or full-board, so you won’t really go out for dinner or breakfast. If you happen NOT to be at one of these establishments, I would recommend you stop at Il Pentolino(kosher Rabbanute Eilat). Why do I say breakfast and dinner you ask? 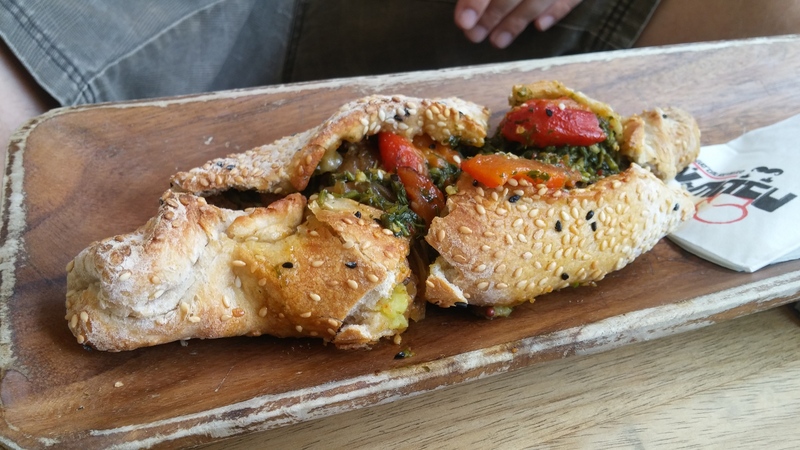 Here’s why: They make some of the most amazing bagels in Israel, in an Italian restaurant! Oh, and the service was very good and the staff was very accommodating and polite. Before we get into bagels, lets talk about my family’s experience there. I was the only one to order an appetizer and since it was December, I went with French onion soup, with a melted cheese crostini. The soup was superb. There was so much depth from the caramelized onions and the cheese melt, crostini was a great addition. 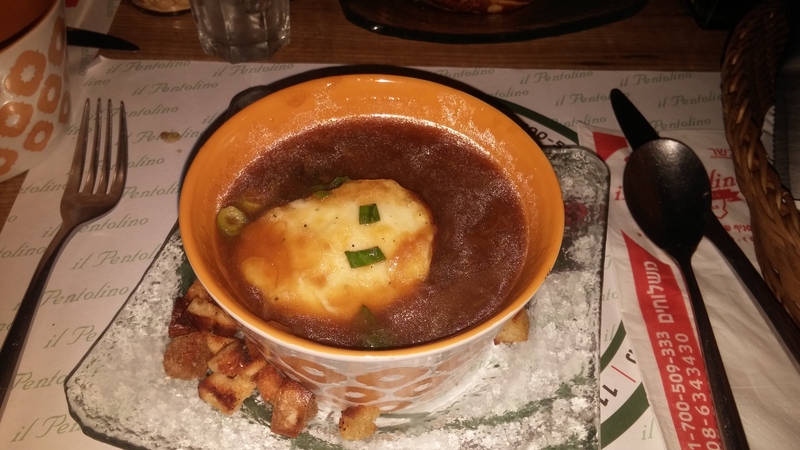 My wife shared it with me and agreed that this was a legit French onion soup, my daughter didn’t understand why my soup was brown, but let’s move on. For the main course we all ordered different things to share, I ordered the lasagna (because I’m a lasagna freak) my wife ordered the oven baked whole trout with baked potato wedges and my daughter ordered the pizza. I have to make a comment about the menu, it’s huge! There are over 15 types of pastas and sauces, 10 types of pizza and the variety of spreads to put on a bagel is huge. I want to mention the bagels because they themselves are worthy of a post on its own. 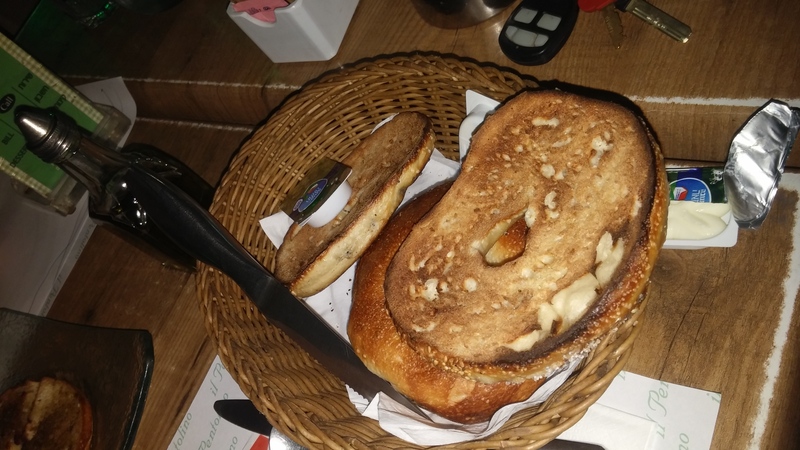 What I loved that they do is instead of offering guests bread at the table, they toast the old bagels and serve them hot, so good! When they brought out the mains we were all salivating, it looked so good, and guess what, it tasted even better. 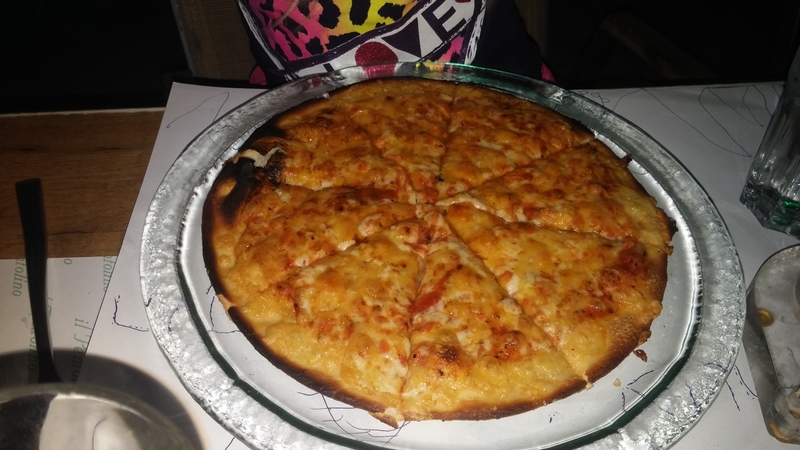 The pizza crust was super crunchy from the fresh dough, the sauce was spot on and the cheese was a great blend of mozzarella and yellow cheese. My daughter loved it and so did we. 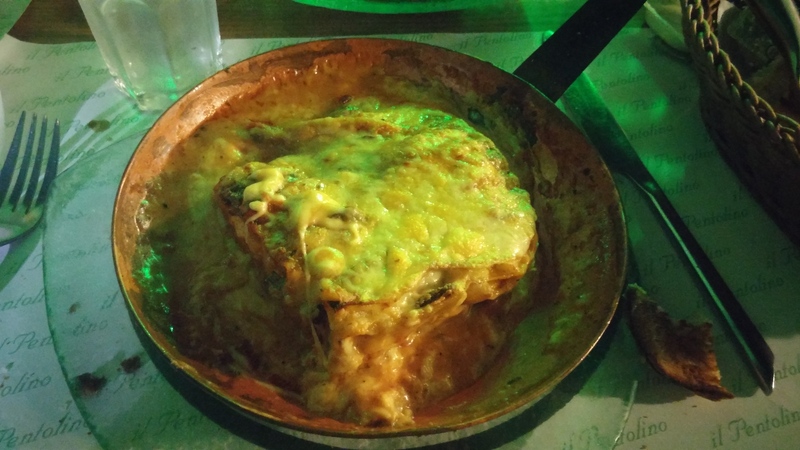 The lasagna was amazingly cheesy and piping hot. I couldn’t wait until it cooled down to taste it and it was so worth burning my mouth for! Fresh pasta, cooked eggplant and so much cheese and sauce! It’s a good thing I had the bagels to mop up all that sauce and cheese. It was like having 2 dishes in one! The fish came out on a platter that could feed five people (The portions were pretty hefty, the way I like it!) and was cooked to perfection. Full of herbs, garlic and the right amount of seasoning to take the fish over the top. It was flaky, juicy and delicious. 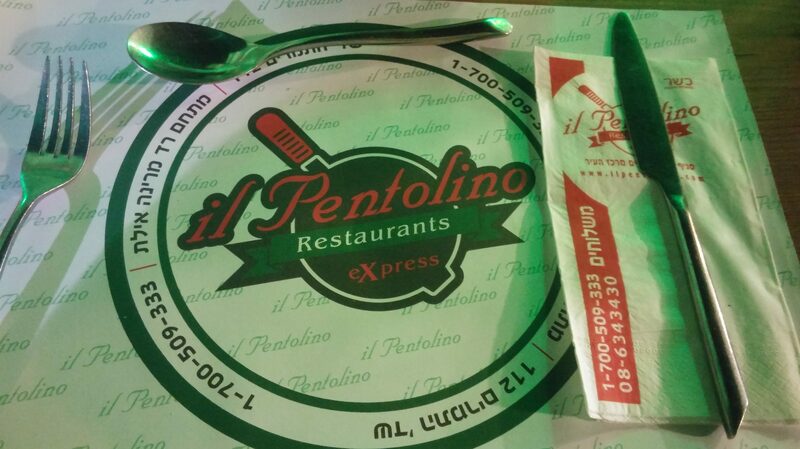 For an Italian restaurant\ bagel restaurant with good service and that delivers to the hotels, I would highly recommend you try IL Pentolino at least once while you are visiting the city of Eilat. Hey everyone. I wanted to give you some updates about what has been going on with me. I recently have been hired by the Joy of Kosher magazine to be their social media marketing manager. Basically to run strategies and all the content that runs over all the platforms of the social like facebook, youtube, twitter and more. This has been consuming a lot of my time, hence why I haven’t really been focusing on my own blog, but I plan on keeping it going and even trying my hand in vlogging at the restaurants where I eat and posting my recipes. I’ll update you guys about that later. I have also been writing for a magazine called the luxury spot, all about Middle Eastern food and posting some cool recipes there as well. I hope you all are enjoying the use of the group and all the stuff I post. My hope is to make the Israeli Foodies group one of the largest foodies group in Israel and to be the number one source about food in English in Israel. I would also like to remind any restaurant owners, if you’d like your business to be featured on an international platform like the culture trip, you can either email me or PM me on facebook and be in touch. I would also like to mention, if you guys could start following me on instagram and twitter, @theIsraelifoodie on instagram and @yudajacobs on twitter. that would be awesome! Anyway, expect a lot of new articles from me, this upcoming summer and also don;t forget to have a great summer! The first time I had even heard of Jem’s(Kosher rabbanute) was on the way to my bachelor party. My friends mentioned this bar that makes their own craft beer and serves kosher food that is all made from scratch, I got excited. This was 6 years ago and I had a merry time. Problem was I didn’t remember how good the food was because the beers were amazing! So I met up one Saturday night with my friend Mitch and wanted to try the one that was recently open in the new market of Kfar Saba. 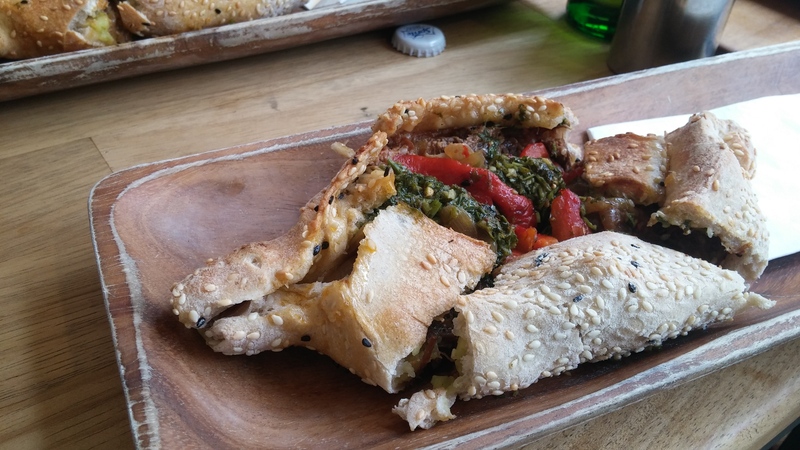 (They have another location in Ra’anana as well)When we got there we encountered a problem, it was first come first serve and the place was packed, and the waiting list was ridiculousness. So we took a detour and went to their original spot in Petach Tikvah. The same place I enjoyed my bachelors party. Really enjoyed! 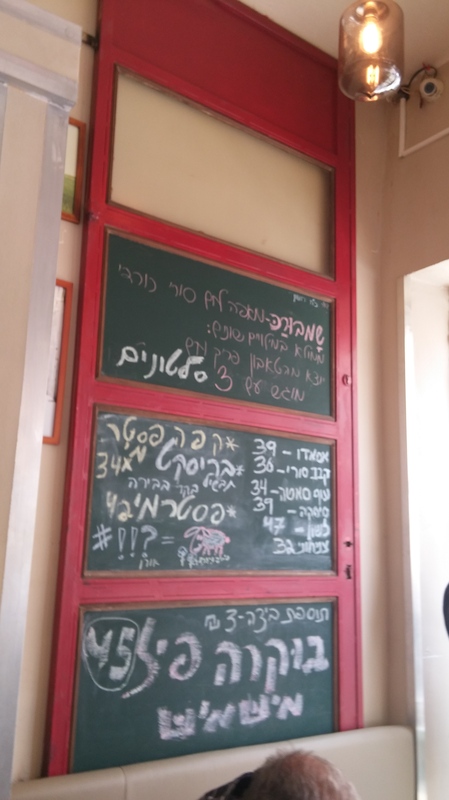 I was determined to get a table so I called on the way from Kfar Saba, and sort of gave them a guilt trip to letting us have a table. And it worked. So the hostess leads us to are table and we get our menu’s. The ambiance at Jem’s is a modern gastro-pub with very dim lighting and music that’s a bit loud. Big vats of fresh beer brewing everywhere, a foodies paradise. Taking a look at the menu, I remembered last time I was there I ordered the variety of homemade sausages and onion rings, but didn’t remember what it tasted like so I ordered it again. Mitch ordered the half a BBQ chicken(he was loosing weight at the time and now is running marathons!) 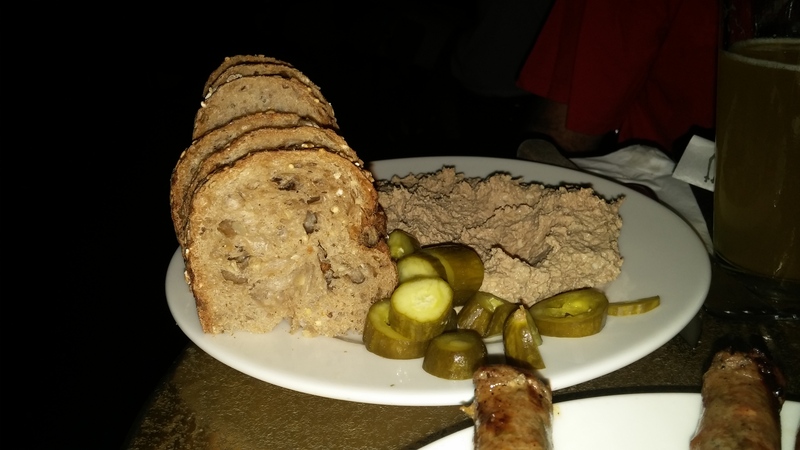 and we shared a plate of pate(chopped liver) with homemade pickles. Oh and of course we had to have the homemade brew! I had a pale ale as did Mitch. I was so happy when the food came! It looked so appetizing and guess what, it tasted just as good! 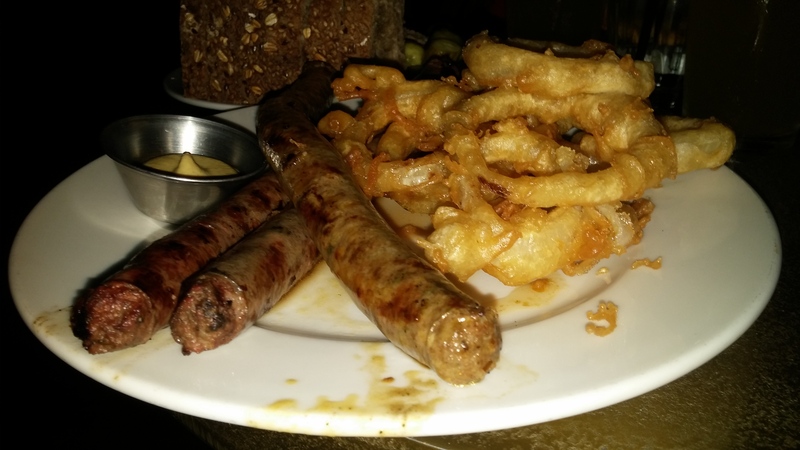 The sausages had a great snap and was packing really good meat flavors. The real deal, as were the onion rings, battered in a delicious crunchy coating that was a great compliment to the sausages. The beer was a great compliment to the sausages as well. The pate was one of the best I have had, it was creamy and full of flavor, and you can’t forget the homemade pickles that were just amazing. Mitch said the chicken was very flavorful and moist, and you need moist chicken otherwise it’s like eating plastic. It was a great meal that was a bit pricey, but if you are already going out to a place like this you might as well enjoy! Not many places like Jem’s and if you find yourself in the area of any of their locations, give it a try. Carne Carne is a fun place for foodie who enjoy two things: a great sandwich, and really good beef. Carne has been able to create this match made in heaven. The only competition that I see that they really is Just Meat on the Ben Yehudah Midrachov, but I feel that they are very different in approach and in price. 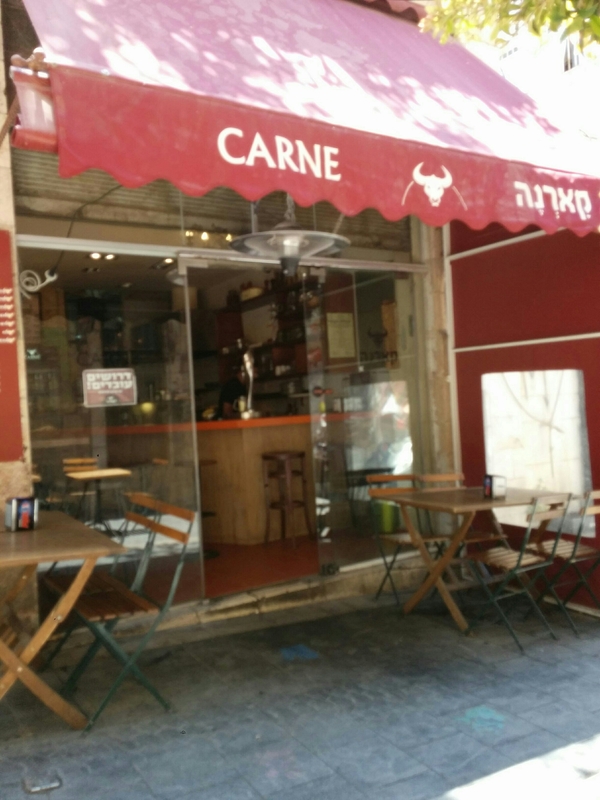 Carne (rabbanut Yerushalayim) is run by two young guys who like to make sandwiches, and make sure the customers are happy. For the full experience you need to let them build you the sandwich, let the artists do their work. 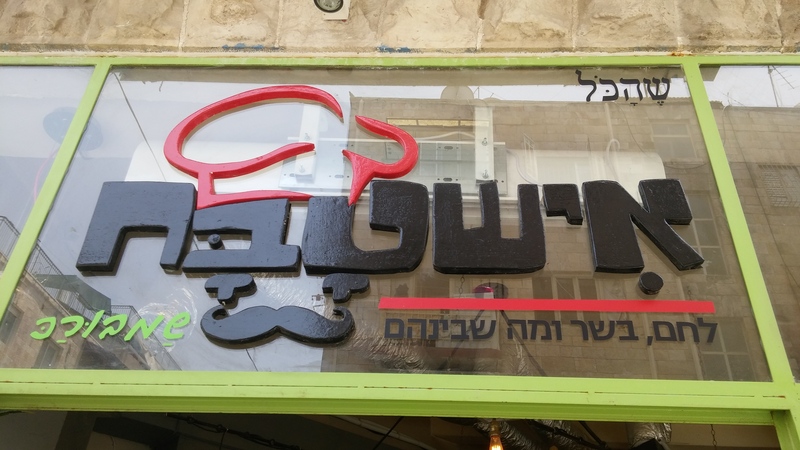 Located in an alley between Ben Sira street and Ben Shatach street, the restaurant is very small, not to many places to sit, but you can either sit on one of the 2 tables outside, or on the bar. The menu there is pretty simple: Entricote, chicken, homemade sausages and for those who for some reason don’t eat meat, they have a grilled portobello sandwich as well. The regular sides of fries, potato wedges and onion rings, but they didn’t have onion rings available the day I went. I met a foodie friend from my Israeli Foodies group group Neil Gillman who also has a blog, and a great perspective on food and life. We decided to order 2 sandwiches and try the: Entricote and the homemade sausages with a side of fries and potato wedges. 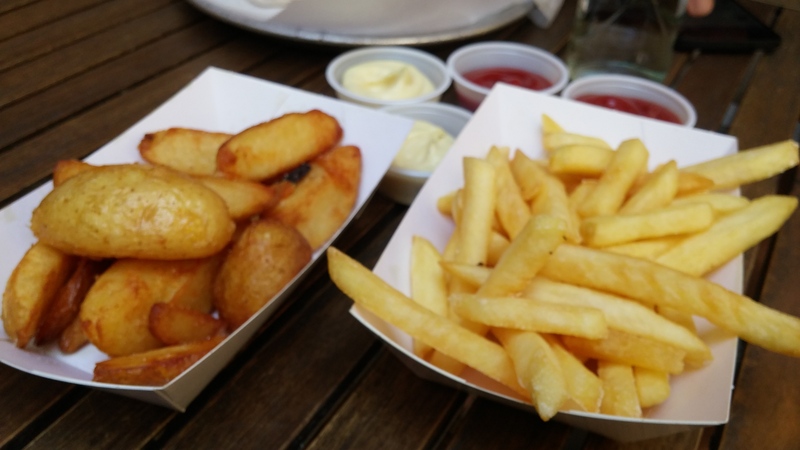 I feel that any time a restaurant offers something made in-house like potato wedges, they will always be better than something frozen or processed. We also asked the owner to make the sandwiches with the whatever he thinks is best. So, how good can a sandwich be? Um, amazing! Well the entricote was amazing. The meat was full of flavor and cooked really nicely, the gepata bun with a nice crunch on the outside, the fresh vegetables and really nice sauces to compliment it all. The homemade sausages had very nice texture but the sandwich itself was lacking. It was missing that kick you get from spice in the sausage, and he didn’t put in mustard. Once we added a bit of heat it took it to a much higher level. Sometimes all a sandwich needs, is a nice kick in the taste buds! The fries were generic but the wedges were very nice. Oh , and the gherkins(the really small pickles) were a delightful compliment to the sandwich as well. The prices weren’t bad as well. To get a very fulfilling and satisfying meal for 60 shekel in my opinion is very reasonable. 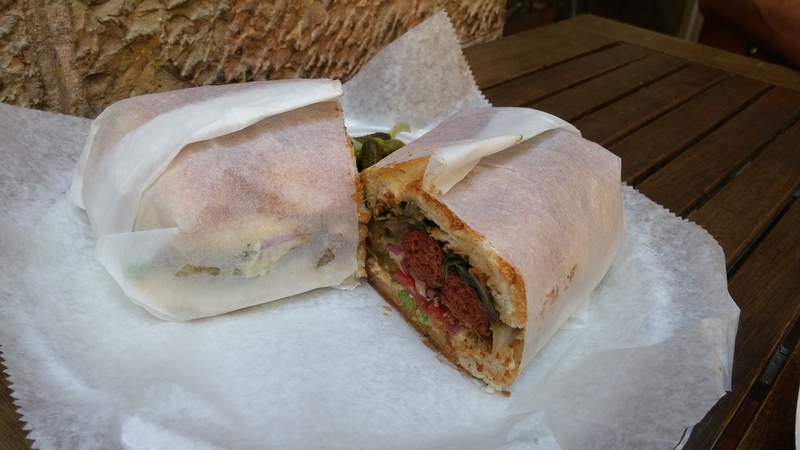 In my opinion, Carne offers a really great sandwich for those who are looking for some really great street food! Machane Yehuda market. What a place. So many places to eat! So many new restaurants, new concepts and original dishes offered, only if I had a bigger budget to try them all out! So I found myself at Istabach(Hashikma 3, kosher badatz) this week my companions having lunch. Istabach sells one item, a Shamborac. What is a shamborac? A middle eastern, hand made hot pocket! 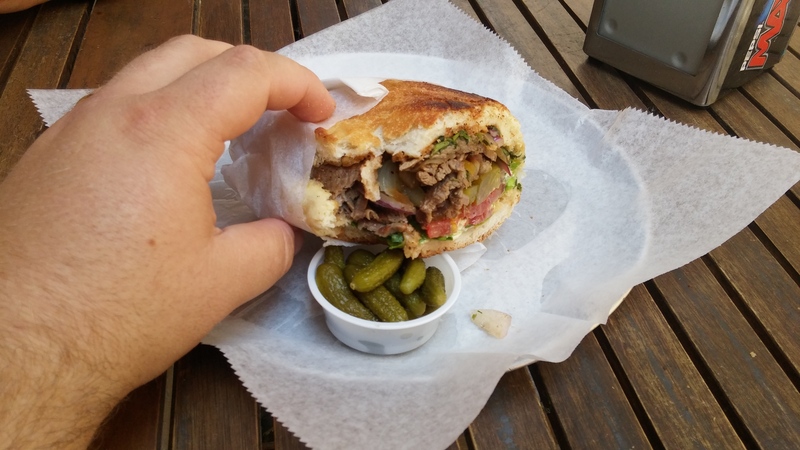 Originated on the border of Syria and Kurdistan, this meat pocket traveled a long way to find itself in the shuk. Each filling for the meat pocket is very different and packed with lots of flavors and very cool textures as well. After talking to the manager and asking whats good, we needed interpretation for some of the fillings like the siske. Siske is the chuck that has been cooked down until melt in your mouth texture. They have even adapted the fillings to attract a wider audience of food adventurists, like pastrami and brisket slow cooked in beer. All of the fillings looked amazing. So we ordered 3 types; Iraqi kabob, the siske and the brisket. While waiting for the shamborac to be ready, because the bake every order on the spot, all the meat fillings are prepared earlier on in the day. While we waited for the shamborac they served us 6 types of salads: watermelon and basil with radishes, beet tabuleh, eggplant, tehini, carrots and garlic and beets salad. The watermelon was a refreshing idea, the tabuleh was nice, same as the rest of the salads, but I really got a kick out of the watermelon. It takes a couple of minutes for the pastry to bake but it’s worth every minute. Rated from my favorite to the least, I LOVED the brisket! Before I talk about how amazing the brisket was I need to comment on the herb and pepper mixture that was put on top of each shamborac. It adds another layer of flavor and another unique twist to this meat pocket. Each one tasted different from the next. Let’s start with the brisket, slowly braised in beer to give it that melt in the mouth texture. Then I moved on to the siske, also slowly braised in a beef stock that melted in my mouth. Lastly the Irqaqi kabob which was very nice and also melt in your mouth as well.But the real star was the dough, man it was crispy and baked to have a really nice crunch on the outside without getting a soggy texture. I was really impressed with the whole meal. One of these meat pockets with all of the salads on the side really fills you up and a really great meal outside of the shuk. 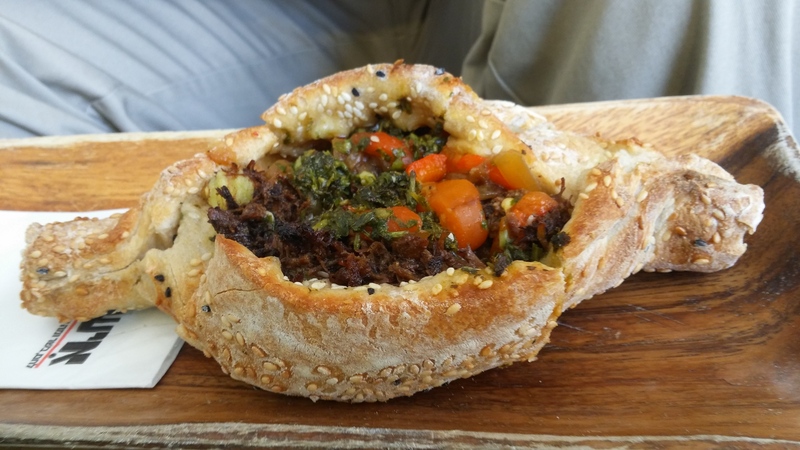 So next time you find yourself in the shuk, you have to try this place! In searching for the best kosher hamburger in the city I have stumbled on a surprise located on Hillel street. 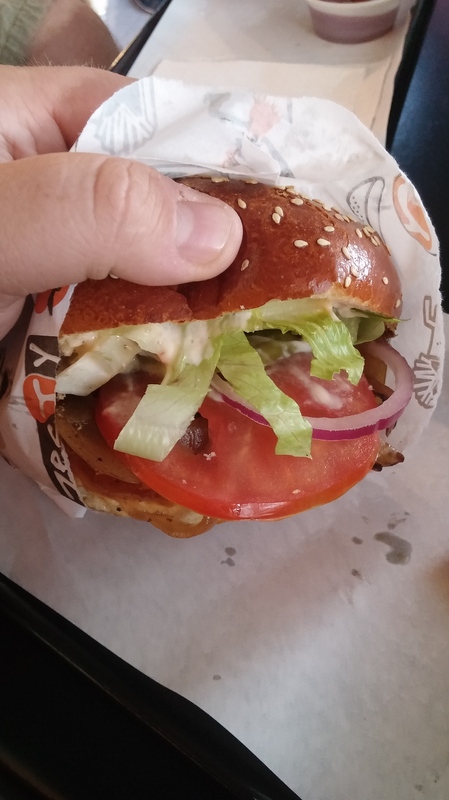 Zesty burger is a hamburger chain located mainly in the north of Israel, have opened up their first Jerusalem location a couple of months back. After seeing a groupon for the place knowing that it’s a new venue, I went to try the hamburger that has come down from the north. The menu that is offered is pretty straight forward,.burgers wraps or sandwiches, that’s it. What intrigued me was the variety of burgers they offer: Classic, short ribs, Mergez, Entricote, Goose(??) and many more. The burger toppings are also really cool like they offer: chorizo, goose breast, pineapple and more. They have 3 levels of burgers that define the type of meal you are looking for. They also offer a couples or triplet meals for those who don’t want to spend too much money on going out. 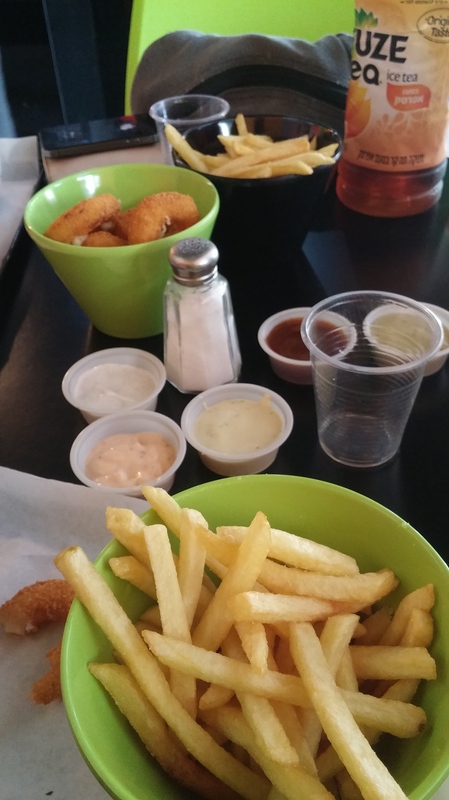 While we were debating between each other about what to order, the guy behind the counter was really friendly and patient and we ended up chatting for a while before we even ordered.We took the triple meal (3 burgers, 2 sides, a large bottle of soft drink 109 shekel)and that’s when the dilemma started. The menu is packed with so many different burgers that all looked really good so I went on the one I figured would be full of surprises, so I picked the short ribs burger, to be done medium. My friends took the same as well. Zesty cooks all their burgers on a flat-top which in my opinion is the only way to cook a hamburger because you get that crust you want on a burger while the inside is cooked to your liking. We also ordered a side of fries and onion rings as well to go with the burger. So when they called us up to put toppings on our burgers, another thing that makes this place really cool are the sauces. The sauces are a bit different from what you would get and much tastier than any other burger chain. For example there is a sauce called Shipkah, which is a crossover of a pesto and chimichuri. Full of flavor and very different. So we get our burgers and sides and sit down, and the guy behind the counter gave us an extra side of fries(really cool) with all the sauces Zesty offers. the first thing I notices about the burger was how fresh everything was; the bun, the vegetables and especially the burger. The hamburger was cooked to a perfect medium and was so tender and full of flavor. What also surprised me were the onion rings, They were full of flavor and really crunchy. The best part were the condiments, because dipping sauces were of the hook! All in all, For a chain of hamburgers Zesty delivers on all cylinders and is a really, and I mean really good! Zesty, Hillel 28, Kosher rabbanute yerushalayim.